FC Barcelona dropped their first points of the LaLiga season on Matchday 5, in the Catalan derby against Girona at the Camp Nou. 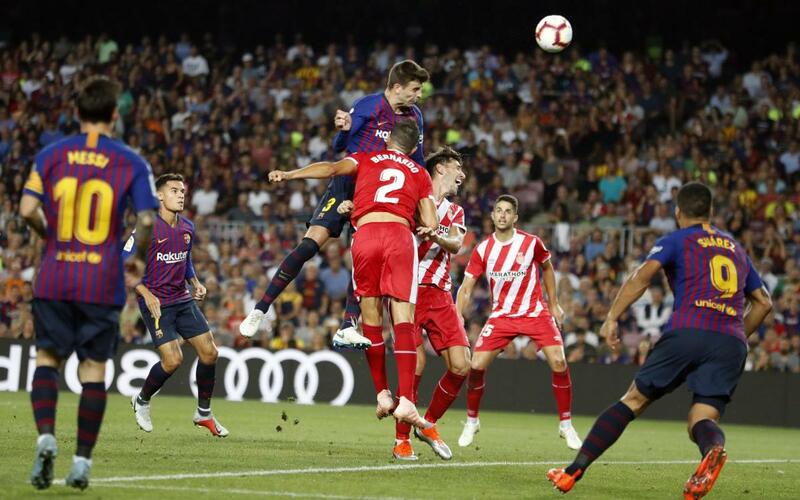 The Blaugrana played much of the game with ten men after a sending off for Clement Lenglet, but came back from behind for a 2-2 draw when Gerard Piqué headed in an equaliser. The game got underway with Marc-André Ter Stegen called into action to save from a Bernardo header, but Barça soon established dominance of possession and chances. A mazy run from Messi, leaving defenders in his wake, culminated in Girona goalkeeper Bono making a stop at full stretch. The chances continued to come, with Luis Suárez and Ousmané Dembélé both having opportunities. At the other end, Gerard Piqué cleared the ball off the line on the half hour mark, when Portu had rounded Ter Stegen. The turning point of a first half that featured severally fouls was a red card for Clement Lenglet, who was adjudged by referee Gil Manzano -using VAR- to have elbowed Pere Pons. The decision left a Barça side dominant on the ball at a numerical disadvantage. Ernesto Valverde reacted by bringing on Ivan Rakitic and Philippe Coutinho for Arthur and Vidal, following on from the change that saw Samuel Umtiti replace Dembélé during halftime. A Messi free kick on the hour mark nearly got Barça back on terms, but clattered against the crossbar. A minute later, another free kick was pushed out by the goalkeeper, as the hosts upped the pressure. Piqué went up for the resulting corner, and stayed in the box as the play continued. When the ball ricocheted skywards, the centre back rose highest to head in from close range on 63 minutes (2-2). From there, the attacks were constant from the Blaugrana, as their opponents defended deep. Despite their pressure, however, the game ended 2-2 at the Camp Nou.